I remember a long time ago, maybe a couple years, my mother became inspired by the teachings of the Vietnamese Buddhist monk Thích Nhất Hạnh. She handed each member of our family a piece of dark chocolate. Our job was to be mindful of this chocolate. We were to savor and enjoy it and let no sensation achieved through its consumption go to waste. In this way we would take the first step in a very long journey towards enlightenment and personal fulfillment. The moral of this story is that some people are really bad at mindfulness. Me, at least. My mind wanders and is seldom at the same place as my current situation. Although it would be hard to say conclusively that it has not helped at all, over a decade of sitting in the silent group worship of the Quaker tradition has not fixed this for me. In Quaker meetings I became expert at wandering my mind rather than at stilling it. I learned the value of contemplation, but not mindfulness. What if there were a practice that could enforce mindfulness? If my brain is not completely on the task at hand, it knows, and it gives me a gentle reminder. 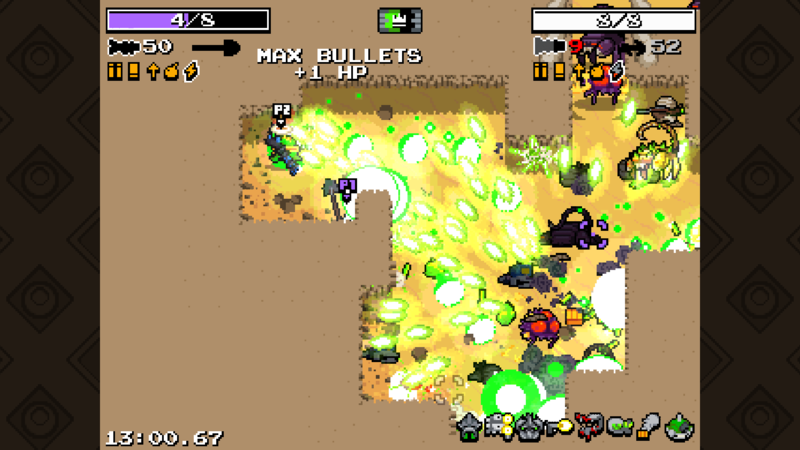 Nuclear Throne is a “Roguelike” game. That means its levels are procedurally generated, that it is easy to die, and that when you die you start over from the beginning. A very general term for a game like this in layman’s terms is “hard.” I can invest ten intense minutes into getting to the third level only to find out the painful way that snipers explode violently when you hit them with an irradiated shovel. In the heat of the moment, though, each lesson is easy to forget. I can’t tell you the number of times I’ve fired a rocket-launching shotgun much too close to a volatile car, attempted to raise my crystal shield to defend against a crystal shield-smashing crowbar, or got too excited with my toxic triple-machinegun and ended up eaten alive by rats as I wandered through the sewers in a desperate search for ammo. Although “gentle” might not be right word, Nuclear Throne is not shy about letting me know when I have allowed my mind to leave the present moment. Incineration by gem-powered gatling laser beam is paradoxically centering. Or rather, it is centering if I make it so. My instinct brought on by this type of game is haste. When I have to start over again from the beginning it is such a dreadful feeling that I want to sprint to get back to where I left off, but that is the path to ruin. This is where I have to remember Thich Nhat Hanh’s teaching – “there is no way to happiness – happiness is the way.” I must take each moment in the game as its own. If I worry about progress once had and lost I will lose what I have now. So, too, if I worry about what I could lose. Each barrage of bullets is its own, each yeti-hurtled car and exploding canister of lethal miasma. To win the game I must let go of winning. I must, temporarily, let go of the outside world. There are a great many places in life where I have succeeded while my mind was elsewhere. However, with regards to the Nuclear Throne, I must ascend mindfully, or I shall not ascend at all.